WILD PACK has performed for the San Felipe Folk Festival many times, not because we're folk music because we're not. But rather because the promoter Tony Norris has been a great friend for many years and when he asks us to play, we do. The last 4 years, Tony has even had us promote the event for him. This year, however, we were going to be on the road and would miss it for the first time in years, but like all good plans, they didn't go through and now we will be in town that same week. Tony was glad to hear we are going to be in town, and we are now in the lineup and very happy to bring some acoustic blues to the folk jam. The beautiful thing is that 4 years ago when we were asked to help promote it for Tony, we decided to add some blues, and blues has been a small part every since. 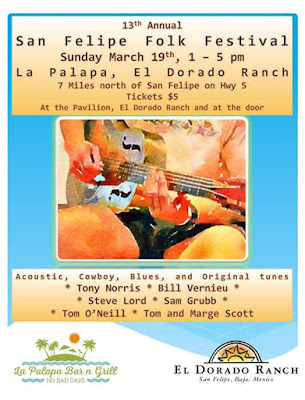 This is now 13 years of folk, country, cowboy and bluegrass has been coming to San Felipe thanks to Tony, and all the great musicians. Please join then this year at the La Palapa Bar in El Dorado Ranch on Sunday, March 19, from 1PM-5PM, the event is only $5 and is fun for all.